The Olympic flame is on course to arrive in the UK this evening (Friday, 18 May) before it embarks on a 70-day relay across the country. 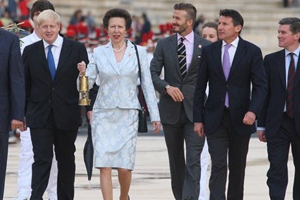 The flame is being accompanied by footballer David Beckham, Princess Anne and Locog chairman Lord Coe, who are flying from Athens in Greece and are due to land at 7.30pm at Cornish airbase RNAS Culdrose for a welcoming ceremony. The torch will then commence its relay from Lands End in Cornwall, carried by the first of 8,000 torchbearers, Olympic gold medal-winning sailor Ben Ainslie. The torch will progress across the UK’s four nations - through more than 1,000 cities, towns and villages - and will reach its destination at the Olympic Stadium in Stratford on 27 July for the opening ceremony of the Games.